The presence of sharks around the Caribbean islands of the Dutch Kingdom has seriously decreased as a result of fishing, and habitat degradation. According to experts 33 species occur around the islands, among which tiger sharks, hammerheads, and eagle rays. A third is of these is considered vulnerable to extinction, another third is near threatened, and four species are already (critically) endangered with extinction. As apex predators, shark species are key contributors to healthy marine ecosystems, adding to their biodiversity and durable functioning. Therefore, the presence of diverse and abundant shark populations indicates the marine system is in a good ecological state. And moreover, the presence of large characteristic species forms a valuable asset for islanders in the form of dive tourism. Sharks are cartilaginous fish, but their biological characteristics are more similar to those of large land and marine mammals than those of bony fish. In general, sharks grow slowly, mature late and produce relatively few young. Their populations typically increase at extremely low rates, rendering them exceptionally vulnerable to overexploitation and slow to recover from depletion. 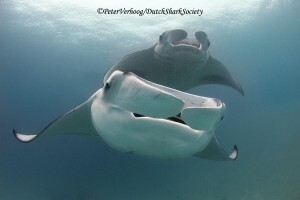 Some of the more extreme examples include the female whale shark, the largest fish species in the world, which can take up to 30 years to reach sexual maturity, the spiny dogfish that carries her pups for nearly two years, the manta ray that gives birth to only two young at a time, and the basking shark, which is thought to live for up to 50 years. Thus, in order to be effective, the management of sharks must reflect a precautionary approach and allow for sustainable fisheries, and focus on safeguarding crucial habitats that can serve as refuge, nursery and feeding ground for these species. 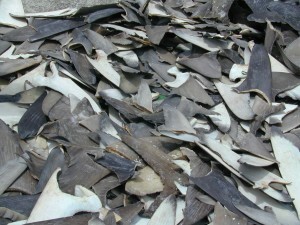 A staggering amount of 100 million sharks are killed each year to support the unsustainable demand for shark fins, which are used in Asian shark fin soup. This particular taste has led to the practice of shark “finning,” the wasteful practice of slicing off a shark’s fins and discarding the dismembered animal back at sea. Of the 591 shark species assessed by scientists within the IUCN, 21 percent are currently threatened with extinction and another 18 percent have a near threatened status, globally. Moreover, for another 35 percent of species the adequate information is lacking to make accurate population assessments. Disclaimer: The term °shark° is a reference to both sharks and rays, unless specified otherwise.